You are entering a fascinating space. You will, if successful, do more to educate your students than any other teacher in your college. You will enjoy contact with their minds and feel the satisfaction they feel when they learn how to get things said they want to say. You will also at times feel stymied. Your materials will not match what you are trying to do. Your students will not have open minds when they should. They will balk at understanding things that are so clear to you. While some will grasp new ideas and perform them easily, others will advance very slowly. The discrepancy can be maddening. And to be painfully honest, you enter a field where the conventional wisdom is often wrong. The conventional ways of teaching writing are significantly mistaken, in my experienced opinion. If you comport with convention you will get the same slow progress that everyone else does. Conventionally, writing is taught as one thing. You know—writing. We’re teaching them to do something, and it’s writing. But that’s a mistake. Writing is two things: the creation of good sentences and the arrangement of sentences into essays. They are not the same thing. The skill of creating good sentences is one thing. The skill of arrangement into essay form is another thing. Certainly they are related—you have to build essays out of sentences—you can’t have good essays without good sentences. You can’t make good essays out of rotten sentences. Good sentences are necessary but not sufficient because you can take a whole bunch of good sentences and arrange them wrong and get a rotten essay. If you agree that writing is actually two skills combined—sentence formation and sentence arrangement—it’s obvious what the teacher needs to do. She must teach first the one and then the other. If you don’t do that, but instead jump around in your course, sometimes focusing on sentences and sometimes on the higher-order issues, you’ll be in the mainstream like everyone else and you’ll see the same slow progress they do. It’s unfortunate, but as of this writing, most of the field of composition either doesn’t grasp that writing is a two-tier skill or thinks it’s not important. These people are wrong on both counts. The two-tier nature of writing is the central fact that an effective writing teacher will work with. 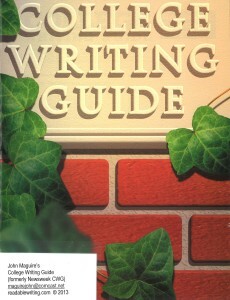 My College Writing Guide lays out first-year writing as a sequence of skills. The first eight weeks covers sentence formation, and at the end of it students can write amazing sentences and paragraphs easily. The second six weeks covers arrangement of those great sentences into clear and organized essays. I don’t fight reality. Writing is a two-tier skill and I teach it that way, and students learn fast. My book is the only textbook around that admits writing is a two-tier skill and works with that fact. To learn how I invented the technique at the Berklee College of Music, read this. To see a video about the five sentence skills I teach, see this. The book comes with an answer key and there’s a lesson plan you can read on this website. You can look at sample exercises in my College Writing Guide as well as samples of student work. I think you’ll find them both compelling. I invite you to do the daring thing–start your career in expository writing by leaving the crowd and entering the world of Readable Writing. All your bookstore needs to do is email me, and you could ask them today.